Real estate brokerage Jones Lang LaSalle just published its North America data center market report for the first half of the year, highlighting new trends impacting the data center industry, such as security, high-performance computing, enterprise hybrid cloud, big data, and AI. But the report also found that absorption of data center space available for lease “returned to normal levels after record leasing in 2016.” Cloud providers, who were largely behind last year’s record leasing, are still a major force in the market this year, while data center construction across the US is heating up. Industry experts and investors have spent the past six months trying to figure out the “new normal” after a record leasing year in 2016, led by hyper-scale cloud service providers Microsoft and Oracle. The JLL report confirms what many industry observers have discussed anecdotally — hyper-scale cloud leasing has been dialed back. The cloud leasing train left the station so fast in 2016 that it sputtered and ran out of fuel toward the end of the year. First half of this year saw more moderate leasing. Read more: Who Leased the Most Data Center Space in 2016? This more normal leasing pattern could serve to reduce the amount of volatility in the publicly traded data center REIT share prices. The six data center REITs’ shares ran up by 50 percent during the first six months of 2016 prior to giving back half those gains during late summer and fall. This year data center REITs have performed well, up 23 percent this year, mirroring the more modest (but still strong) data center leasing during the first six months. While leasing in the Northern Virginia data center market is down 25 percent compared to last year, there is plenty of space under construction which will be delivered during the second half of this year. The San Francisco/Silicon Valley data center market has once again lived up to its reputation as being one of the “lumpiest” Tier 1 markets, down almost 95 percent year-over-year. A lack of entitled land limiting new supply makes it difficult to measure current demand after a record 58MW of critical load was leased by this time last year. So far, Montreal and Atlanta have doubled up on leasing success year-over-year, while new supply in Dallas has helped to jump-start leasing during the first half of 2017. 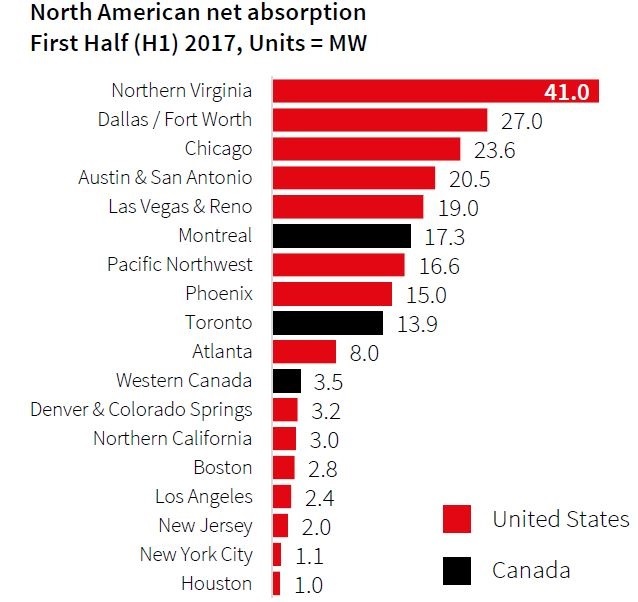 Notably, in Toronto JLL reports 41MW currently under construction. This is a huge increase over prior years, which equates to over three times the impressive 13.9MW of space absorbed there year-to-date. One prediction made earlier this year by JLL managing director Bo Bond, a Dallas market expert, was right on the money. Lease signings for block and tackle corporate requirements dried up in Dallas during the final quarter of 2016, partially due to lack of supply. The new supply and pent-up demand in Dallas resulted in solid enterprise leasing results. 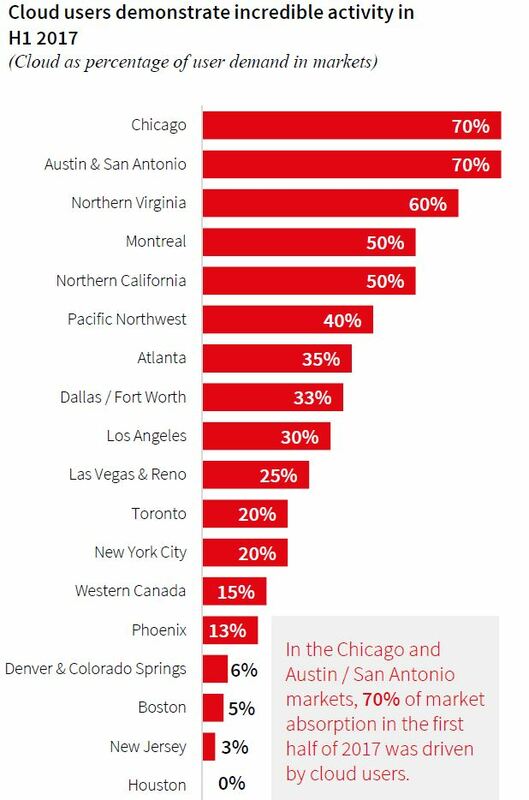 Dallas has indeed leapfrogged Chicago to become the second strongest US data center market behind Northern Virginia. Chicago remains a hot wholesale market mainly because of hyper-scale leases. However, two-thirds of the Dallas leasing was due to more traditional corporate requirements, including enterprise hybrid IT deployments. The chart below shows that cloud leasing is still driving a significant amount of the absorption in several of the top markets. However, Pacific Northwest, Atlanta, Las Vegas/Reno, Toronto, and Phoenix joined Dallas in the camp where the majority of deals where inked with enterprise customers. A slowdown in hyper-scale signings has left some larger blocks of space available for corporate users who were shut out in some markets due to “The Great Absorption of 2016,” according to JLL. Another artifact from the massive cloud leasing during 2016 is the 43 percent increase in data centers reported to be under construction. Data centers under construction last year totaled 353MW in capacity, compared with the 506MW currently underway. High Performance Computing (HPC) is becoming a more cost-effective solution than public cloud for some big data applications. Heat generated by newer processors is requiring data centers designed for at least 200 watts per square foot (rendering some older data centers obsolete). AI processor technologies allow companies to leverage predictive analytics to automate more tasks. Recent hybrid-cloud announcements by Microsoft, Oracle, VMware, and others to support enterprise private cloud should accelerate deployments. Security upgrades are requiring more rack space and must be carefully planned in conjunction with data center expansions. M&A activity has skyrocketed in the first half of the year, reaching north of $13 billion, and is likely to continue. JLL believes that the publicly traded data center REITs will continue merger mania (“activity is nearly guaranteed”), as acquisitions of assets and takeover targets play out the remainder of the year.